Vogelsang’s newest press line stars a refurbished 400-ton Bliss press along with a new servo feeder and refurbished straightener. It joins a line installed in 2008 anchored by a new 220-ton Stamtec press, also equipped with a new servo feeder as well a refurbished Raster reel-straightener combo and Prab scrap conveyor. The conveyor runs under the press and through an outside wall to a motorized chute and into a hopper. plant in Lakewood, NJ, has added 220-ton and 400-ton press lines, and expects to add a third line within the next two years. 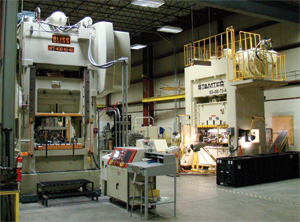 The expanded stamping capabilities—the German-owned subsidiary runs presses from 40- to 400-ton capacity—has triggered significant growth for the company’s expertise in manufacturing custom, rolled tubular parts used in suspension assemblies such as cradle mount clinch rings, hydro-bushing sleeves, shock-absorber and eye rings, and compression limiters in plastic parts. From its 50,000-sq.-ft. plant, which the company moved to in 1990, Vogelsang specializes in the manufacture of non-threaded fasteners. It also specializes in multislide and rollforming. But in 2008 its focus shifted, when it received a directive to grow its tubular-parts manufacturing capacity using a metalforming process developed by the German parent. To successfully integrate the German-engineered process into his facility, the plant invested in two new press lines, the latest centered around a refurbished 400-ton Bliss press along with a new servo feeder (from Cooper-Weymouth, Peterson) and refurbished Brown & Boggs straightener. All of the equipment was purchased through local distributor Wenco Machinery, Ringwood, NJ. Full production for the new line begins in April of this year. The 70-ft.-long 400-ton press line includes a knurling machine that profiles the strip coming from the feed line. Two loops even out material flow—one loop lies between the decoilers leading to the straightener and out into the knurling tooling and then into the profiling station, and a second loop lies between the profiling station and the press feeder. a line installed in 2008 anchored by a brand-new 220-ton Stamtec press, also equipped with a CWP servo feeder as well a refurbished Raster reel-straightener combo and Prab scrap conveyor. The conveyor runs under the press and through an outside wall to a motorized chute and into a hopper. An automatic rotating spreader evenly distributes the scrap throughout the 20-yd. scrap hopper. The CWP ServoMax SE servo feed includes matte chrome rolls, 500-job memory and a hand-held remote jog pendant, and boasts roll-position accuracy to ±0.002 in. Vogelsang’s model offers maximum stock width of 18 in. and full-width thickness capacity to 1⁄8 in. And, its Stamtec S2-series straightside press generates as much as 220 tons of force, 50 to 120 strokes/min., 6.3 in. of stroke length and a bolster measuring 72 by 48 in. Sideframe opening is 31.5 by 19.7 in. Together the two new lines account for about 15 percent of the company’s overall revenue, and Stuban expects that percentage could double in the next couple of years—hence the likelihood of a third press to be added to the family. The press runs a die that combines the features of a transfer die and a progressive tool. The material stays with the coil as it runs through knurling, profiling, and then into the press. After U-forming, the part is cut free and a transfer tool pushes the part into a final rolling operation to close and clinch the seam. Two loops even out material flow—one loop lies between the decoilers leading to the straightener and out into the knurling tooling and then into the profiling station, and a second loop lies between the profiling station and the press feeder. The 70-ft.-long line runs at 40 to 60 strokes/min., “although we expect to run considerably faster with the line in full production mode,” Stuban adds. “And, the process generates very little scrap since we’re developing trim lines—there is no cam trimming. See also: Bliss Press USA, PRAB, Inc., Formtek-ME, The Brown Boggs Machine Company, Stamtec, Inc.